Animals face extinction all over the world, and it’s almost always driven by the loss of their natural habitat. Animals are forced into smaller, isolated pockets of land and into ever-closer contact with humans. This makes life harder for them, as they struggle to hunt for food, find mates and breed successfully. Closer contact increases conflict between wildlife and people, often with catastrophic results. With so many species on the brink of extinction we must work harder than ever. We’ve created a Conservation Partnership Programme to support the very best conservation experts. We’re supporting four partners already, who are working tirelessly to save snow leopards, slow lorises, Persian leopards and giant otters –animals that are all in desperate need of help due to the effects of habitat loss. Rampant mining is destroying the rugged mountainous snow leopard habitat of Tost, South Gobi. The leopards are also often killed in retaliation for killing domestic livestock. The area was declared a nature reserve in 2016, so Bayara can now work on making the area secure for snow leopards and their prey. Several mining companies have existing licences to work in the region. Bayara’s aiming to get them all revoked. And she’ll also be training rangers to prevent poaching. Then the mountains can return to being a safe haven for Mongolia’s wild animals. Having lost 90% of their tropical forests, exposed and vulnerable slow lorises are captured and sold illegally through the pet trade, for medicine or exploited as props in tourist photos. Traders cut out their venomous teeth, so even rescued animals can rarely be returned to the wild. Anna’s tackling the illegal wildlife trade head on, orchestrating a mass social media campaign to stop tourists posing with captured slow lorises. 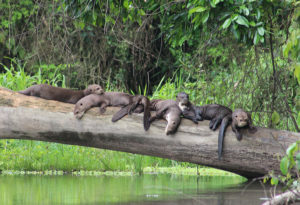 Giant otters, already hunted to the point of extinction for their fur, now face massive habitat loss from deforestation. On top of that 40 tonnes of mercury is being poured into the water every year as a result of gold mining. Adi will be educating locals about the risk mercury poses to people and wildlife He’ll also be measuring mercury contamination in otters and the fish they eat to see which areas need the most protection so otters can thrive again.